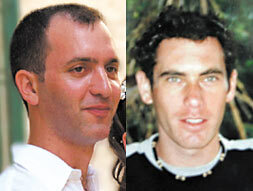 On July 12, 2006, Ehud Goldwasser and Eldad Regev were patrolling the northen border of Israel with Lebanon in two armored IDF Humvees when they were attacked by Hezbollah militants who crossed the border from Lebanon into Israel. Hezbollah captured them and then demanded the release of Lebanese prisoners held by Israel in exchange for the release of the abducted soldiers. Israel refused and launched a large-scale military campaign across Lebanon in response to the Hezbollah incursion. Thus started the 2006 Lebanon War. Since the time of their kidnapping by Hezbollah there has been no communication from them. They are not thought to be alive and will be part of a prisoner of war exchange between Israel and Hezbollah. There is no ELS for Goldwasser as one word in the Torah. Therefore, we follow the standard protocol and break the name up into two key words: Gold and Wasser. We search for either of Soldier or The Soldier. And we search for Was captured. With expected number of ELSs set to 100, the probability that a text from the ELS random placement text population would have as compact table as that produced by the Torah text is 25.5/1,000. With expected number of ELSs set to 100, the probability that a text from the ELS random placement text population would have as compact table as that produced by the Torah text is 25.5/1,000. 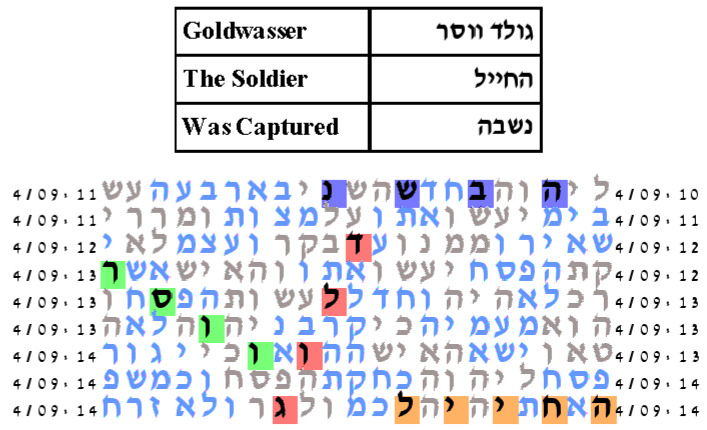 We use the key words Eldad and Regev and search for either Soldier or The Soldier. And we search for was captured. With expected number of ELSs set to 100, the probability that a text from the ELS random placement text population would have as compact table as that produced by the Torah text is 4.5/1,000. With expected number of ELSs set to 100, the probability that a text from the ELS random placement text population would have as compact table as that produced by the Torah text is 4.5/1,000.